Since July, satellite tags have been collecting data about fur seal foraging behavior while autonomous Saildrones collect data on fur seal prey. Now it’s time to recover that data—and that requires a down to earth approach. Carey Kuhn begins her day by climbing into a wooden box with two of her coworkers. On three, they pick up the box and trot to the workplace, Flintstone’s style. They park near a harem guarded by a large, aggressive male, and get to work. That’s a summer workday. If it’s fall, the team belly crawls to the job, GI Joe style. That’s what Kuhn and her colleagues from the Alaska Fisheries Science Center’s Marine Mammal Laboratory are doing this month. 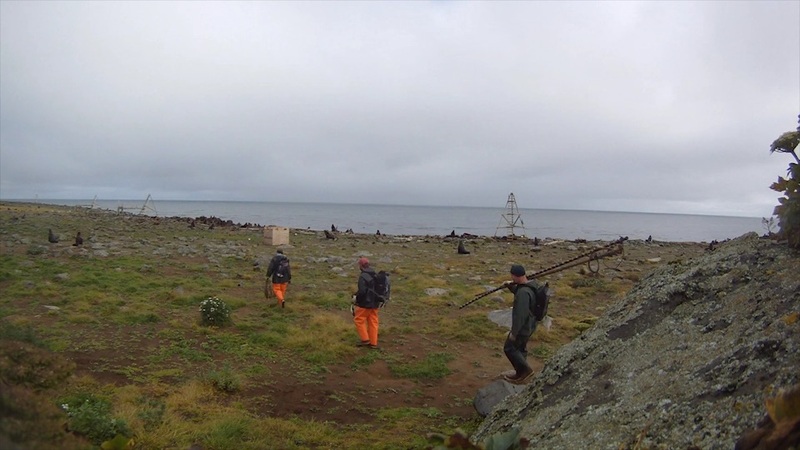 As part of their study of the relationship between Pribilof Islands northern fur seals and their prey, the team tagged 30 females in July to track their foraging behavior. Since then, the tags have been transmitting the seals’ locations via satellite, but have also been storing highly detailed data about the seals’ diving behavior and environment. Now it is time to recover the tags with this wealth of data. But first they have to catch the seals. As it turns out, the way to approach a fur seal depends on its mood—and that depends on the season. “Hidden” in their box next to the harem, the team pulls a mother-pup pair into the box. The scientists glue a tag onto the female’s fur, and weigh and measure mom and pup before releasing them back into the harem. Your browser version does not support video playback. To view to this video clip download this MP4 or upgrade your browser/use a different browser. Recovering the tags now, in the fall, requires a new approach. Once they have caught a female and pup, the scientists will trim the data-filled tags from the female’s fur, and again weigh both mother and pup. The first part of the process may be especially challenging this year. Kuhn has been tracking Pribilof Island fur seals for more than 10 years, but this year offers an unprecedented opportunity to learn more about them. Though northern fur seals are one of the most studied marine mammals, no one can explain why the Pribilof Island population has declined since the mid-1970s. A critical piece of missing information is the relationship between fur seals and their main food source, walleye pollock. Now Kuhn’s team is using cutting-edge technology to begin to fill that information gap. “Saildrone technology gives us the ability to do something we’ve never been able to do, but always needed to: directly compare seal foraging with fish resources,” says Kuhn. Saildrones are unmanned vessels that operate on wind and solar power, and they are able to go places that people are not easily, or cost-efficiently, able to go. This summer two Saildrones were programmed to collect data on the location, depth, and number of fish within the feeding grounds of the seals, at the same time that the tagged seals were collecting data about their own foraging behavior. Alex De Robertis, a fisheries biologist at the Alaska Fisheries Science Center, will analyse the fish data collected by the Saildrones. 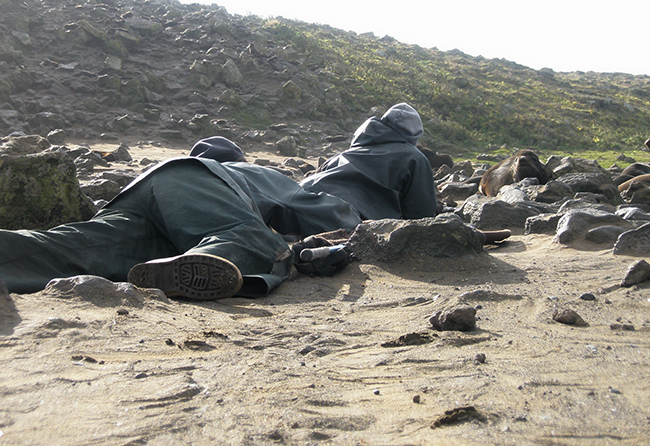 Once the seals and Saildrones have brought in their data, Kuhn and De Robertis will combine the information about food resources, foraging behavior, and pup growth to find out how the distribution and abundance of their fish prey affects the seals foraging behavior, and how that in turn affects the well-being of seal pups. Watch for initial results this winter. 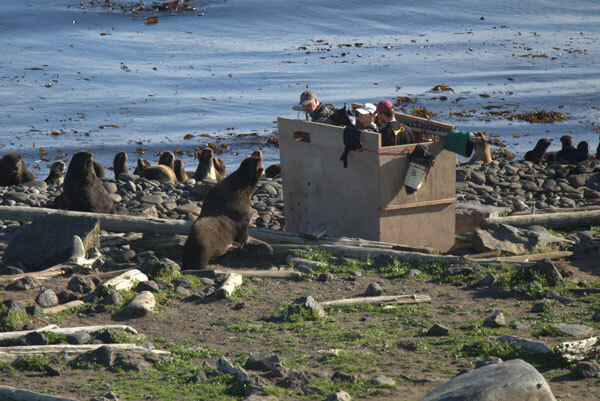 In the meantime, check out Kuhn’s blog for reports direct from the field, where she will be belly-crawling her way to a better understanding of Pribilof fur seals.